CATHAY IP partner countries represented were; the UK, Portugal, Spain, Angola, Cyprus, Venezuela, Slovenia, joined by international leaders of the group from Australia, Hungary and Poland. 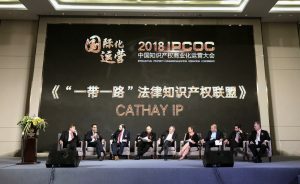 The IPCOC conference hosted hundreds of top level IP specialists and decision makers, representing the governmental, academic and business spheres of China. Presentations were delivered by professionals from the highest level of Government and prominent IP guest speakers (including an International IP Arbitration judge). An inaugural speech of CATHAY IP was delivered by Mr Ernest Kus, founding partner of the CATHAY Group. Participating CATHAY IP partners were also honored to be invited to join a roundtable discussion about global challenges of IP commercialization with a special focus on Chinese companies going abroad. There was a day of local government and business meetings organized by Sinofaith, with the aim of promoting IP and investment opportunities and build bridges between Cathay member countries and China. Meetings included one with the Chinese Green Technology Bank. The Bank has been established to assist China in becoming the world leader in green technology. The Green Technology Bank offers unlimited potential to any company that wishes to access the Chinese market or has green technology they wish to develop or sell.